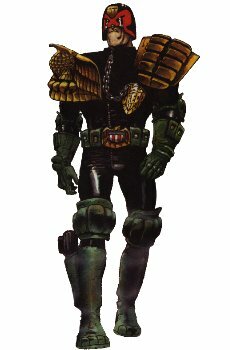 Launching in August 2002, the Judge Dredd RPG will be the first fully supported game by Mongoose Publishing portraying characters and creations from the hugely popular comic. Based around the highly adaptable d20 games system, Judge Dredd will finally take gamers on to the streets of Mega-City One and beyond. Players will have the opportunity to take on the role of either a near-invincible Judge or be part of an expanding criminal organisation as a perp. Rapid reinforcements to the Judge Dredd RPG will include exciting supplements giving never before seen information on all the Mega-Cities of the world, notorious perps and creeps, resources of the Justice Department, the Apocalypse War and much, much more. Immediately following the launch of Judge Dredd, will be the Slaine RPG, based in the Celtic world of the Warrior King. Future releases around this licence will support both Judge Dredd and Slaine, as well as introduce new characters and games inspired by the well-known comic strips. Mongoose Publishing are very excited with the sheer potential this licence offers for the most intensive and detailed role-playing experience of the new millennium.